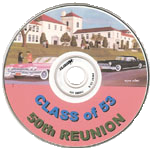 Our full color memory book will memorialize your reunion and capture those memories of a lifetime. They will contain photos of the committee, candid photos from your event, all of the formal portraits, a "Letter from the Committee" page, an "In Memory" page, the "Class Directory", and a "High School Memories" and "Classmates We Missed" page. The format of the books can be tailored to meet your needs. We also custom-make memory books for reunions where we do not take the photographs, as well as for independent photographers. We also arrange for our group photographer to attend the event to photograph your entire class. The process of taking this photo takes roughly ten minutes. 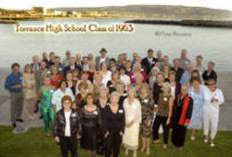 From this an 11"x14" group photo is made that is bordered in the school colors with the class mascot or logo included. Our photographer will take app. 70-110 candid shots throughout the evening of classmates having fun, class memorabilia, dancing, table shots and small group shots. We put these photos on a CD that will be view-able on your computer. Our photographer will arrive at your event with all necessary equipment to photograph you and your classmates. Our photographers are experienced professionals specially trained to produce high-quality portraits. We send between 2-3 photographers and assistants depending on the size of your event. We don’t want you or your classmates to wait in line to have their photos taken-we want you to be having fun! 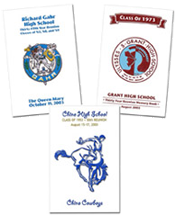 Our photo badges are reproduced and enlarged from your high school yearbook (color or black and white), bordered with your school colors, and plastic laminated to last a lifetime. They feature the graduate's name to help identify fellow classmates at the reunion.